5) The cynical (yet perhaps realistic) way that our federal government was portrayed. Overall, I came away with a not so idealistic view of one of our greatest presidents. Perhaps it is for the best to see how our government has always operated? Even so, I did really like the movie and, on a scale of ten, give it ★★★★★★★★. Catch my other min-movie-reviews by selecting "Movies" above. While I liked the movie, I would never take it as a factual historical document. I have no confidence in Hollywood's ability (or desire) to research and present historical truth. Integrity is not much of a consideration when the film industry decides to make a picture. There are real historians who are interested in preserving truth and fact in history. I'd really like to know there view of the accuracy of this movie. Thanks for the feedback arosmith. The movie was based on a part of Pulitzer Prize-winning historian Doris Kearns Goodwin’s 2005 book "Team of Rivals: The Political Genius of Abraham Lincoln". I imagine other historians might disagree with her take on the passage of 13th Amendment. My take away is that this sort of nasty political stuff in DC has probably always been there. Doubtful that it will change anytime soon. Agreed. Not sure who to believe (ever) when it comes to politics. I agree, Bob, it's a nasty thing. I believe they said you're better off watching sausage made than laws. Still, I loved seeing a man of proven honor and how he chose to live within the world that is. Lincoln walked the knife's edge of the law, and admittedly did so with a clear desire to see his name recorded in the history books. I see him faced with two options. Win at the only game in town or lose. It was a joy to see how he really conducted himself, to see what a man looks like when he's changing a very ugly world. I hear you Kevin. Love the sausage example. Good thought to consider as we watch what is going on in DC. I liked the movie and politics is and always will be corrupt in my opinion. I thought Daniel Day Lewis was amazing as he always is in the roles he plays. So true Debby. The political process is corrupt even though most politicians probably are not. Lincoln was caught between a rock and a hard place, the stubborn determination of his son Robert to go to war and that of his wife Mary Todd to keep Robert out of the war at all costs. The cushy job was probably the best compromise between the two that he could manage. Sadly Lincoln had to make a lot of compromises to acheive his ultimate goals of ending slavery and the war. Hard to know what I would do crownring. I do think that the children of our leaders are often given preferential treatment. Maybe it simply points to how power can corrupt our decisions? My thinking is probably influenced by my experience of being drafted into military service. 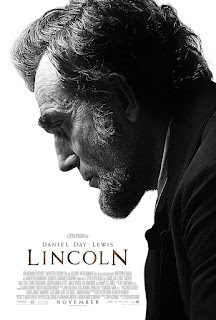 I did appreciate how the movie did not paint a rosy picture of Lincoln and the political process. Better that we understand the reality of compromise than stay ignorant of it. Another thought about Lincoln and his son's military service. Seems like he really believed in the cause (much like many who believed in the Iraq and Afghanistan Wars) but did not believe enough to send his son (like many who believed in the Iraq and Afghanistan Wars). It reminds me about how only 1% of our nation's families have really supported these wars. Speaks to me of the superficial patriotism that we see today.